Hi there! As I was thinking about what to share this week , I realized we hadn’t completed the cottage tour! We missed the bathroom. Everyone needs to know where the bathroom is 🙂 . I had fun creating this space. 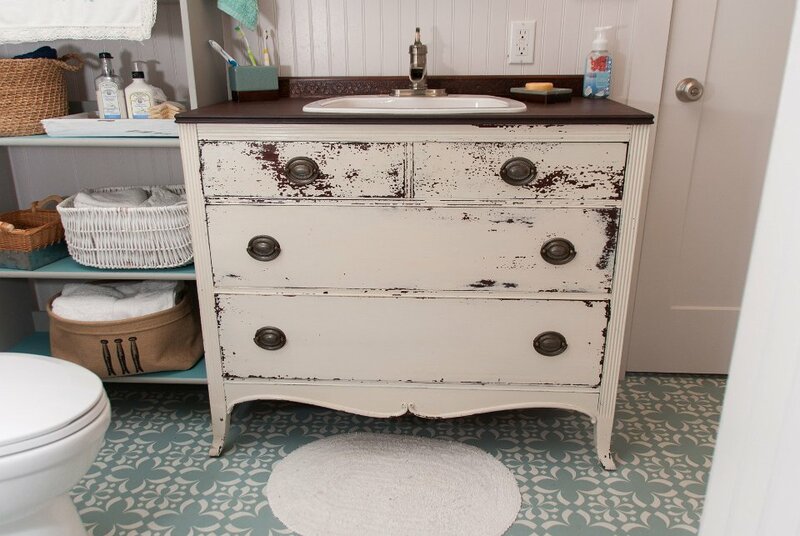 The creative juices started with a dresser of all things! 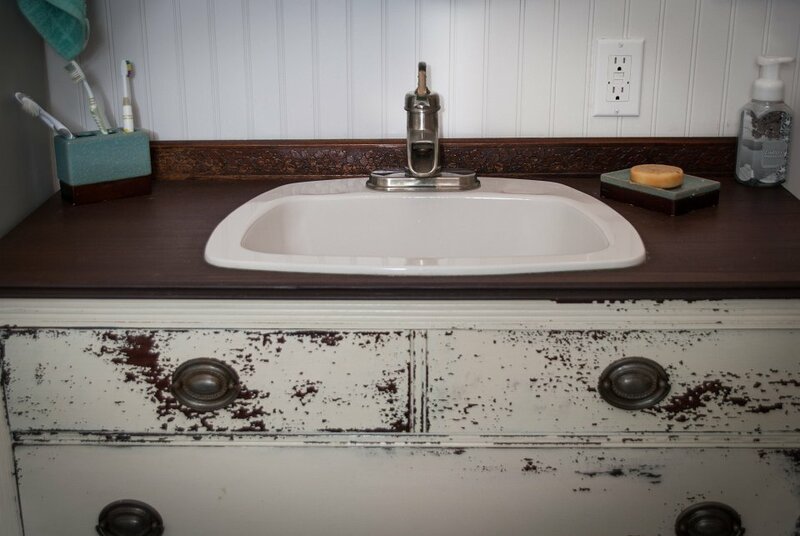 When I was looking for ideas and DIY solutions for a sink and vanity, I came across lots of people who had converted a dresser into their vanity. I found the perfect dresser on Kijiji that was the right height and drawer configuration to be able to convert it to a vanity. Mark was able to get holes cut and drawers shored up to be able to get the plumbing in and through the back. We can still use the drawers which is what I was hoping for with this type of dresser. 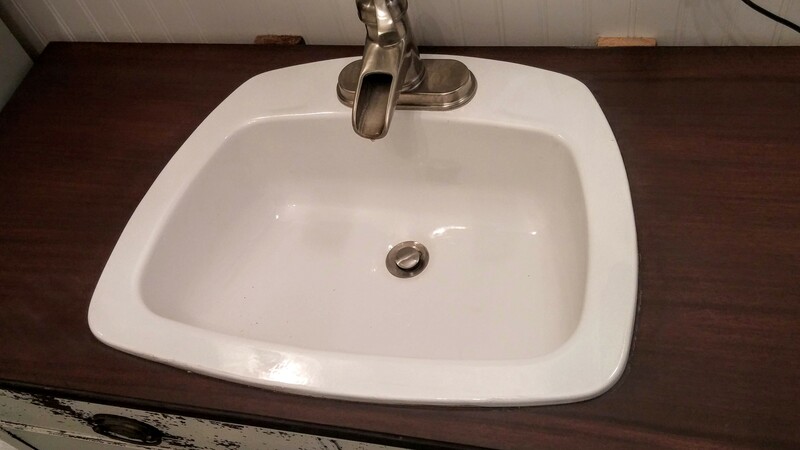 It was on the narrow side so I had a bit of a harder time to get a sink to fit but we found one. Our biggest splurge was the faucet I fell in love with. I think it is by Pfister. Mark surprised me with it one day when I didn’t think we could get it. The dresser was the 1st thing I painted with Miss Mustard Seed’s Milk paint . I wasn’t thinking of documenting everything back then so I don’t have a before picture. I remember not loving it in the beginning. The dresser took 3-4 coats and I had to put a coat of shellac on the sides at one point because the reddish stain was bleeding through. I didn’t know what I had gotten myself into. I remember talking to Wendy at Front Porch Mercantile about it but she encouraged me to keep going. In the end it is one of my favourite pieces I have redone. I sanded down the top and used Milk paint in Curio watered down as a stain. 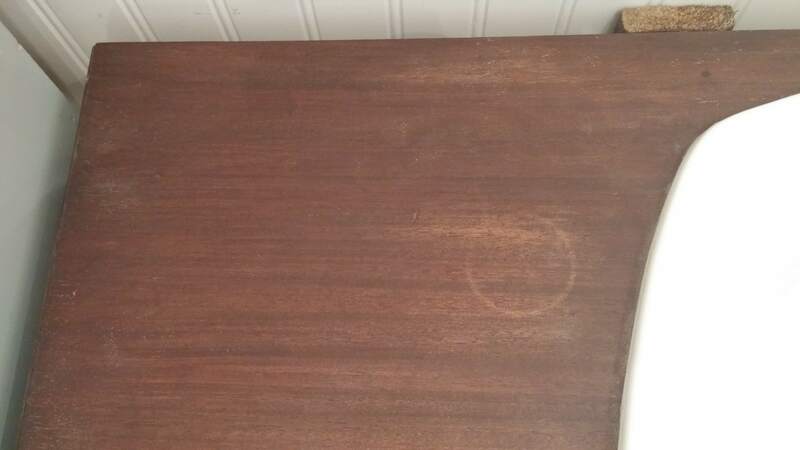 I had sealed it with tung oil but after a couple years, something got left on it and there was a large imprint left. I resanded it lightly this year, applied more Curio and sealed with 3 coats of Fusion’s Tough Coat. So far it is holding up but I treat it very tenderly. 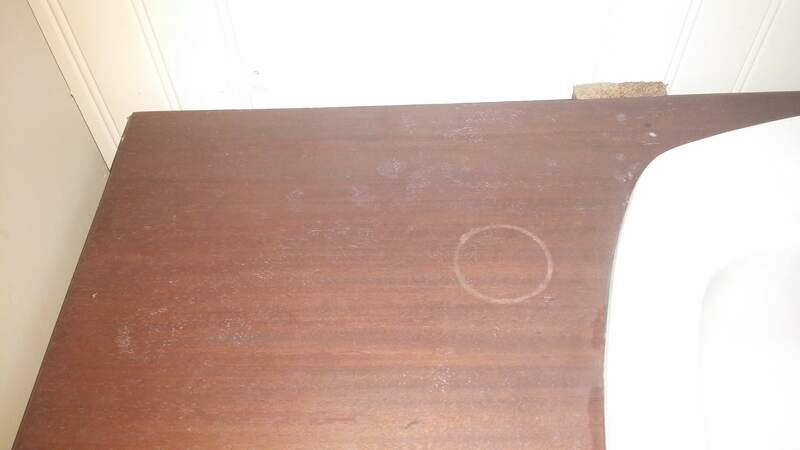 ( You can see the before and after pics below ) Because it was a dresser there was no edge at the back so I just stuck a piece of wood trim I had been keeping and it matched up perfectly as an edge for the back of the vanity sealed in Tough Coat as well. I had gotten this IKEA shelf on Kijiji also and painted it up with Fusion Mineral Paint and Annie Sloan Chalk Paint. Mark also had to do some trimming on it so it would fit beside the sink in the corner of the bathroom. 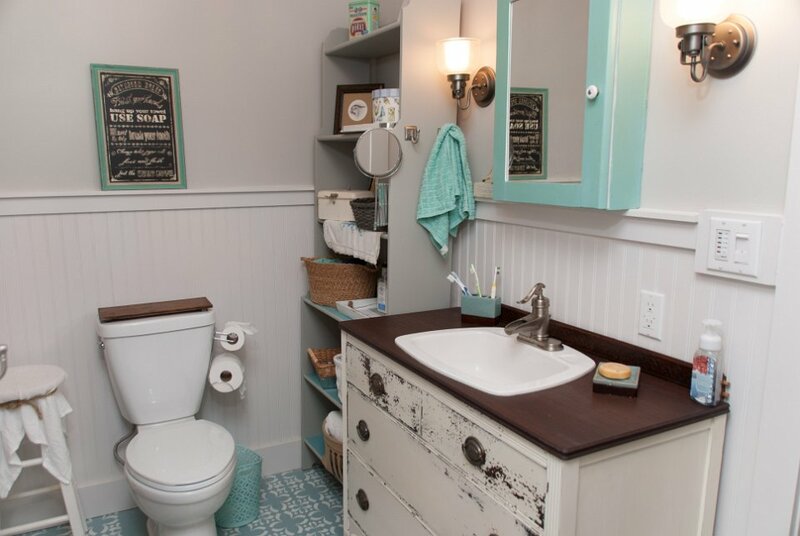 It’s great for holding our bath necessities and towels. One of the other big jobs in the bathroom was painting the floor. I had seen Melanie at Carte Blanche do a stencil treatment on her floor and wanted to try it here on our concrete floors. I love how it turned out!! It was just Sherwin Williams floor paint, the same we had used throughout the cottage. I used a large stencil I had bought off Amazon. 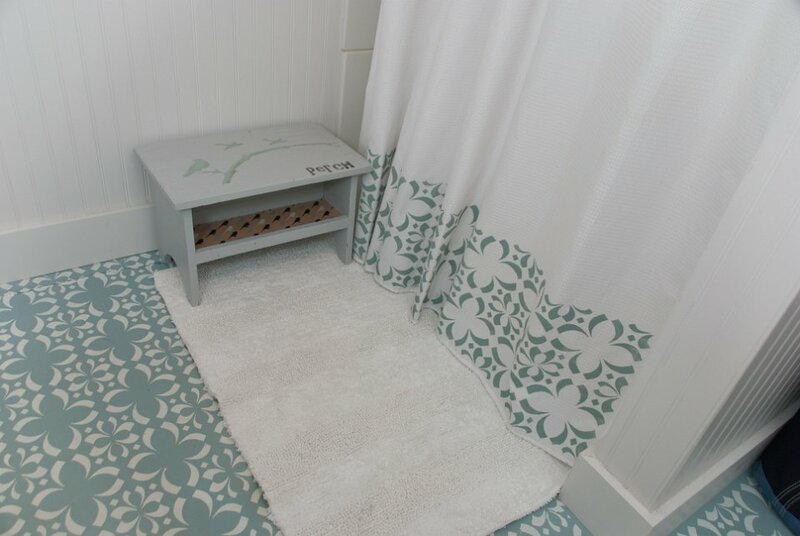 I went up with the stencil and Chalk paint onto the bottom of the shower curtain to add a little interest 🙂 That little stool started out very dark and sad and rough looking but cute now to hold your bath essentials or to put your foot on to dry after the shower. This area is behind the door. For an inexpensive window treatment I took an embroidered pillow case I had collected, put some rings at intervals on the sides, tied some cording through them and through a couple rings on a board at the top that we stapled the pillow case onto. My own little roman shade. The towel rack was just made out of reclaimed tongue and groove with some neat hangers screwed on that I had gotten at Kent with a spot to write our names on each of them. I got the cute little washboard from my grandmother and gave it a paint treatment with Milk paint and a little stencil as well. We put up MDF beadboard panels around the lower half of the walls and finished with a couple pieces of plain trim on top. 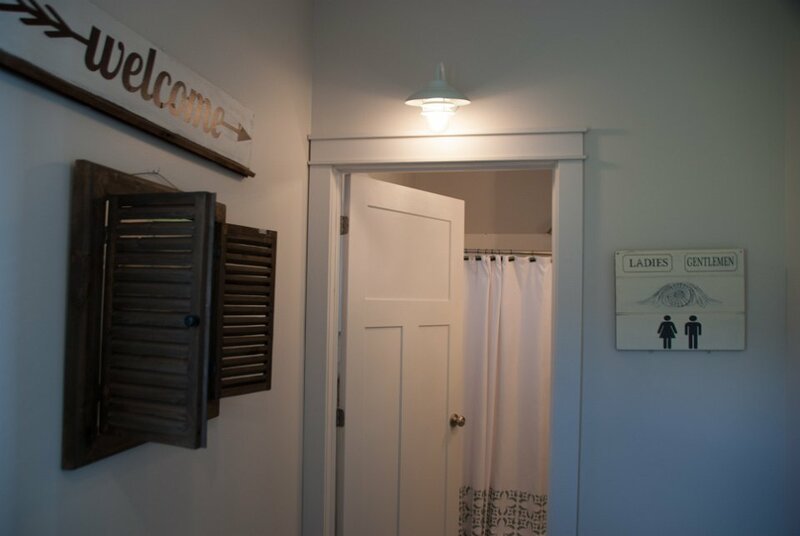 We still have a large corner area beside the shower that is targeted for a claw foot or soaking tub but our ideas keep changing about what we might do with the space and possible expansion when we move here full time in a few years. There have also been other things that take our extra money right now so the tub still gets pushed down the list! It will be finished some day! I hope you liked the tour of the bathroom and that it give you some inspiration as well to get some treasures to paint up for your own place. Next week we will have some Fall inspired projects! I love decorating for Fall at our house in Moncton. What is your favourite Fall activity? 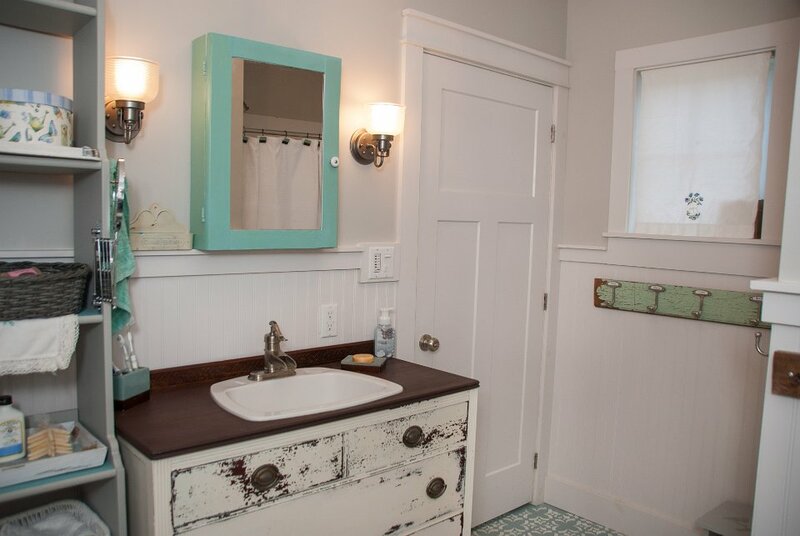 This entry was posted in Cottage, Uncategorized and tagged bathroom, chalk paint, milk paint, vanity by Sheila. Bookmark the permalink.